Happy Wednesday, readers. Today I’d like to share with you some interesting tidbits I learned from Linda Hitchcock, lifelong Kentucky resident and friend to several Amish and Old Order Mennonite families. One of her good friends works as a “driver” for those who usually use horses and buggies to get around. Her peak driving months are post harvest, from mid-October until around mid-March, when most crops have been planted. The Amish will still drive for doctor and dentist appointments and major grocery shopping trips. But the long-distance travel for weddings and visiting relatives isn’t done, except in rare emergencies like funerals. This driver mentioned that the ultra-conservative, Schwartzentruber Amish, are much quieter during these trips. They don’t make jokes or laugh much, and do not sing along the way. The less conservative Amish sing on long trips and aren’t inclined to be so serious. In Kentucky, most Amish weddings take place during the late fall and winter. January, particularly around New Year’s, is a very popular time for weddings! Drivers of the Amish get their business by word-of-mouth, and often take their clients great distance to North and South Dakotas and beyond, staying with the relatives as their hosts. Amish as now living in thirty states, along with Canada. Happy New Year, readers, and I hope 2013 is off to a good start for you and yours. Here’s our winner of Saving Gideon by Amy Lilliard….Johnda Scott! Johnda…you’re the next winner on Home Thoughts of a great piece of Amish fiction. I will be contacting you privately. I am pleased to announced book three of the New Beginnings series is done and being sent to my editor at Harvest House today! I am tickled pink to get it done on time. 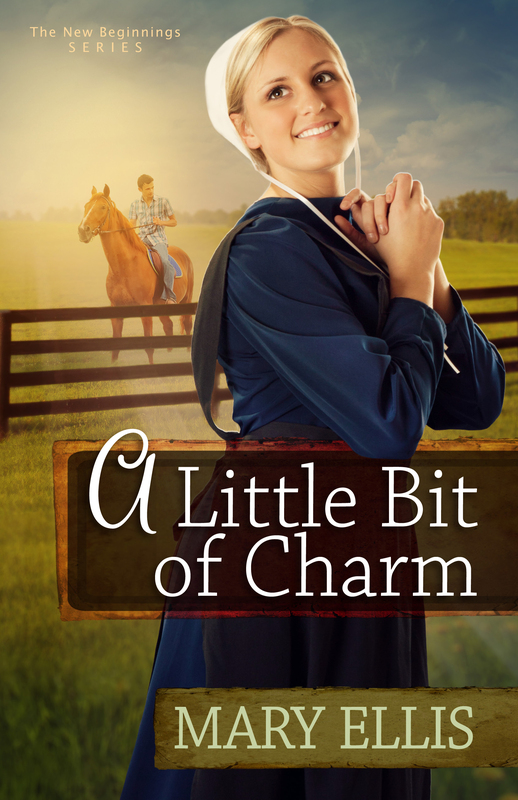 A Little Bit of Charm will be released this summer. Book two of the series, Love Comes to Paradise, has received it’s first editorial review from Romatic Times Magazine. They gave it 4-stars! Here’s the capsule version: The second New Beginnings novel is a sweet, adorable love story with credible characters who want a fresh start and to leave painful memories behind them. They encounter unexpected obstacles and rely on their faith to help them break through those obstacles. Ellis gives the Amish culture the respect it deserves, and her research on the Amish way of life shines in each of her stories. Thanks so much, RT magazine. I’m not sure what the weather is like in your neck of the woods, but here in Ohio (central and northern) we’re getting a blizzard at the moment. What a good day to stay indoors and build a fire in the fireplace. And if you’re looking for something to do while you’re shut in, (especially if you got a new E-reader for Christmas…) my latest book, Living in Harmony, is on sale in Kindle, Nook, Kobo, Apple, and the Sony Reader. From now until January 2nd, Book One of the New Beginnings series is under 3.00 at all participating distributors, including Amazon, CBD.com, Barnes & Noble, iTunes, etc. In fact, Amazon has it for 2.44. What a deal! Living in Harmony won the 2012 Lime Award for Excellence in Amish Fiction by the Christian Manifesto. So if you’re fond of Amish fiction, now’s the time to pick up my latest for cheap. Book two of the series, Love Comes to Paradise, will release end of January through the Internet, and by February 1st in stores. In the meantime, be safe, stay warm and dry, and off the roads if they’re nasty. We have a winner of Rebecca’s Rose, folks…. Without further ado, we have a winner in the drawing for Rebecca’s Rose by Jennifer Beckstrand. Drum roll please…Mary Ellen Ashenfelder, you are the lucky winner. I’ve met this writer and she is a lovely person, beside a great writer. So Mary Ellen, if you would contact me via email (not on the blog) with your mailing addresses, Jennifer will send a copy of Rebecca’s Rose out to you. Here in Ohio, it’s raining and showing the first signs of fall. Yes, our furnace has already been on because I am a freeze-baby! Today I’m back to work, trying my best to make headway in Book 3 of the New Beginnings series, A Little Bit of Charm. Keep the faith, readers, and always make time in your busy days to read!